Sails are coming off boats now, wet and salty at best. Perhaps some of you are keen to valet them yourself. If so, we suggest you read the notes that follow because according to Irish sailmakers there have been some sad sights in sail lofts when enthusiasts brought in home washed sails in the past! 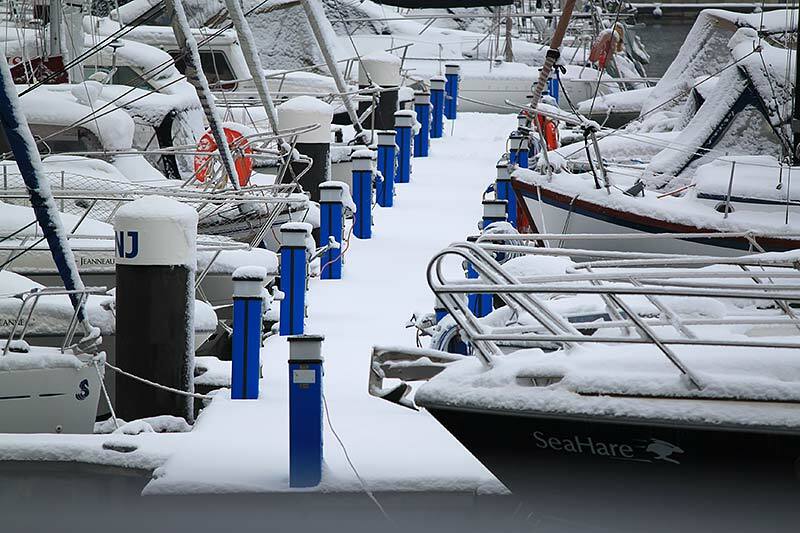 Here sailmaker Des McWilliam provides an overview on the steps to be taken with your sails this winter. Caused by storing sails wet and dirty, or salty. Remove by soaking for 2 hours in a cold solution of 1 part of bleach (Domestos etc) added to 10 parts of water. Rinse afterwards and repeat as required. Small areas can be cleaned with a dry cleaning fluid such as TRI or PERCHLORETHYLENE. For larger areas use a cleaner such as Polyclens. Brush it well into the fabric, leave it for 15 minutes and wash off in lukewarm water. Please note that some grease stains will contain metal or rust particles which are hard to remove. Try 1 oz. oxalic acid in a pint of hot water as a rust remover but do wash the sail and your hands thoroughly afterwards. Don’t use paint stripper – it removes sail and all! Try alcohol (but not the best Jameson’s) or Meths. If that isn’t potent enough use TRI or PERCHLORETHYLENE, followed by a 50/50 mixture of acetone and amyl acetate. Wash with warm water and detergent to avoid the very un-nautical smells! Having got the worst stains off your sails, you now come to the washing – and maybe at this stage the thought of ringing us to collect and wash is quite attractive! Small sails can be washed in the bath and large ones on a clean wash down area, using a scrubbing brush and a hose. Don’t use water hotter that comfortable hand temperature. Any brand of liquid detergent can be used. Very dirty areas can be treated with neat detergent and left overnight before scrubbing off. Don’t leave the sail to soak or dry on corrosive or hot pipes – you might end up with dirtier sails or have odd shapes heat-shrunk into them. Speaking of odd shapes, this is the perfect time to get your sails re-cut to bring back their original shape, speed and performance. When you get your sails back from us, store them in a dry place and when the 2013 season comes they will be in the best possible condition to serve you once again. Des has also noted that it is important to warn against leaving roller headsails and mainsails on the rig over the winter. If a yacht is not going to be used for more than a month, the sails should be removed and stored below. Ideally dry and loose so that they can be aired. Even in winter, the damage caused by UV radiation weakens and embrittles the sail and UV cover fabric. Add to that the acidic exhaust and household heating emissions (especially in winter) from the city upwind of the marina. No UV cover attached to the leech of the sail can prevent this from being washed into the furled up sail and attacking the long chain polymers in the Dacron. My own experience shows that sails left on the rig in the Dublin area degrade in strength at twice the rate of identical sails on the West Coast. Every year we get to replace headsails that have broken loose on the furling gear during storms. Bad enough when the yacht is in the marina, potentially disastrously expensive if the yacht is on the hard and is blown over….. Yacht clubs and boat yards would be well advised to insist that sails are removed before the yachts are lifted. If after reading this advice and you’re in need of some professional help, Sailmakers like Des at UK Sails and others have arrangements for the pickup and delivery of sails from the marina forecourt. This article originally appeared in Afloat Magazine and we are grateful for their kind permission to reproduce it and to Des McWilliam for his update to the original article.